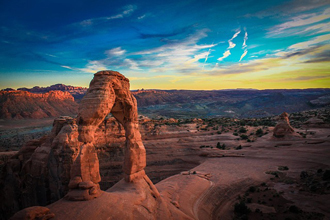 Arches National Park is the largest concentration of natural stone arches in the world. In 1929, it was initially established as a National Monument. 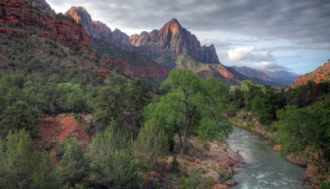 Congress made it a National Park on November 12, 1971. 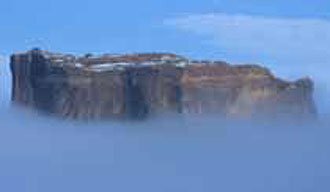 It’s an arid desert located just five miles north of Moab on Highway 191. A 3½ - 4 hour drive from Salt Lake City. The beautiful red desert landscape has been uniquely transformed over time by the gradual formation of oddly shaped sandstone formations. There are over 2000 sandstone arches spread throughout the 73,000 acre park! 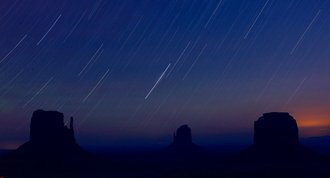 Be prepared for the variety of conditions you’re likely to face when you get to Arches. For one thing, it’s a desert. But it’s also located at a relatively high altitude. From 3,900 feet/1200 meters to 5600 feet/1,700 meters above sea level. There are also several campgrounds in Arches. 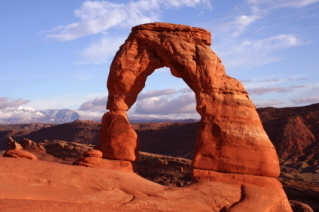 The 1½ mile hike to the most famous site in Arches National Park - Delicate Arch - is spectacular. The most awe-inspiring feature of the hike is that you can't see the arch itself during most of the hike. You see it just before you walk up to it. The closer to sunset you can make this hike, the more jaw-dropping it becomes. Viewing Delicate Arch for the first time is one of those "never quite the same" moments. Visitors tend to take a lot of time sitting and taking it all in. Enjoying just being there. And marveling. And the closer it gets to sunset, the better it gets. A photographer's dream. As the sun goes down, the light and the shadows dance all over the natural amphitheater playing tricks on your eyes. The 2.0-mile/3.2 km hike through the Fiery Furnace is moderately strenuous taking from 21/2 to 3 hours. It’s a virtual maze of narrow sandstone canyons. The “trails” aren't marked. Join one of the ranger-guided hikes for this one. 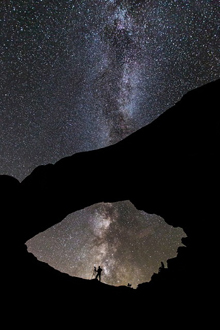 Arches National Park is a wondrous experience for the lone explorer or for a whole family. As mentioned above, hiking trails lead to many of the features. If you are physically able to, hiking is the best way to enjoy Arches. 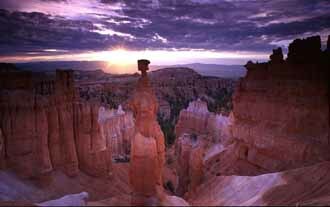 You’ll find a lot more about the hiking trails in Arches by going to our Hiking in Arches National Park page. Landscape Arch is the longest span in the world! 290 feet (90 m) long and 188 feet (58 m) high. The lower end of Devil’s Garden known as the Fiery Furnace is a fantastic maze of vertical red rock slabs which seemingly glow in the setting sun. It’s such a labyrinth that unless you or someone you’re with knows it well, don’t venture in without being part of one of the ranger-guided hikes. The 2.0-mile/3.2 km hike takes from 21/2 to 3 hours. The “trails” aren't marked. Just about everything of interest in Arches can be seen either from the road or by taking short walks. Although not a hike and not a trail, this is one of the more striking rock formations in Arches. 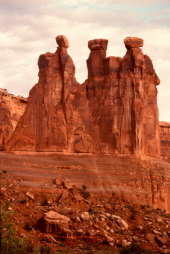 The Three Gossips do in fact look like three people whispering among themselves. You’ll find them in the Courthouse Towers area of Arches. The red sandstone formations take on a variety of colors depending on the light and time of day. They’re one of the most recognizable configurations in Arches probably because they can be seen right from the road. As you look at photos of Arches National Park, you may catch glimpses of a beautiful snow-capped mountain range in the background. The La Sal Mountains. Utah's second highest mountain range. This range contains six peaks that rise more than 12,000 feet. Mount Peale is the tallest at 12,721 feet. 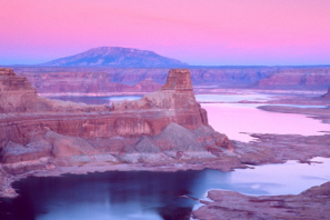 The La Sal Mountains are covered with aspen and fir forests and dotted with mountain lakes. A refreshing oasis allowing one refuge from the dry often scorching conditions of the surrounding desert. The La Sals provide great hiking, biking and horseback riding opportunities from late spring to mid-autumn. 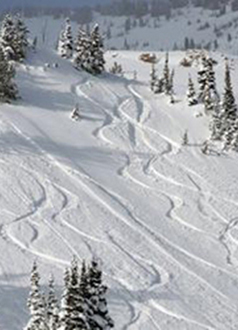 These same trails are used by cross-country skiers and snowmobilers in the winter. 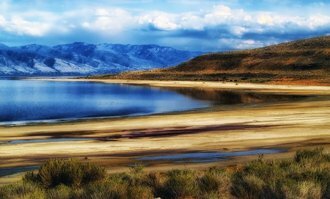 If you just want an enjoyable and scenic drive, you can drive the La Sal Mountain Scenic Route. 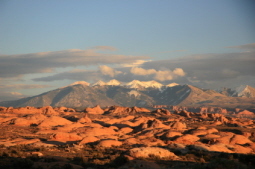 You can also read more about The La Sal Mountains in the Moab section of our site.